This disease was confirmed in Indiana recently. Cercospora blight initially causes small, oval, gray to tan lesions with red borders (Figure 1). If a 10X hand lens is used, dark flecks within the lesions may be observed; these flecks are where the spores of the causal fungus are produced. Severe infections may cause entire ferns to turn yellow or brown. 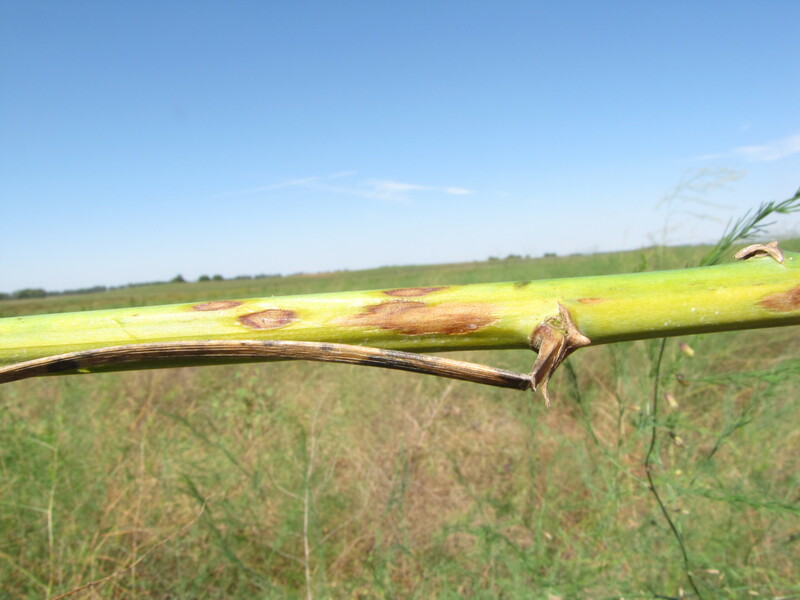 Cercospora blight may cause reduced vigor and yield of spears the next spring. The causal fungus overwinters on fern residues left on the soil. When weather in the late spring or summer becomes favorable, spores on this debris may cause disease on the ferns. High humidity in the fern canopy of 95% or higher and average temperatures of 77 to 86°F favor infection. Splashing water from rain or irrigation is important in spread of this disease. Any practice that minimizes fern debris will help to lessen the impact of Cercospora blight on yields. Growers must balance the benefits of crop residue for preventing erosion and maintaining soil organic matter with the possible disease problems associated with the survival of the Cercospora blight fungus on crop residue. Management practices that minimize crop residue include burning (in accordance with local ordinances), mowing/chopping ferns and then tilling them or re-ridging or even removing ferns in small acreages. It may be necessary to apply fungicides to keep Cercospora blight from spreading. Three to five applications should be made starting prior to row closure when ferns are about 4 feet in height. Volume of the fungicide applications should be sufficient to get good coverage of the ferns. Drop nozzles may increase fungicide coverage. Chlorothalonil products (e.g., Bravo®, Echo®, Equus®) and mancozeb products (e.g., Dithane®, Manzate®, Penncozeb®) are labeled and will help reduce the severity of Cercospora blight. Figure 1: Lesions of Cercospora blight of asparagus are gray to tan and may have red borders.